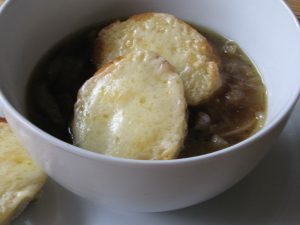 French Onion Soup is one of those things that you order out at a restaurant that seems like it’s complicated to make. It really isn’t. 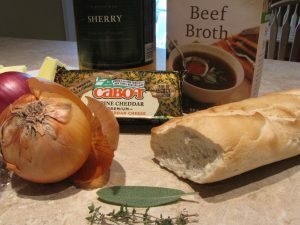 Sure it takes a little time but it’s simply onions, butter, some herbs, beef broth, with croutons or bread topped with ooey, gooey melted cheese on top. 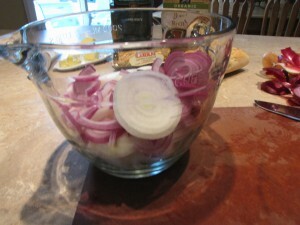 I like to use a combination of onions like sweet Vidalia onions, yellow cooking onions and red onions. Chop them up into chunks or thick slices. Why? As the onions cook down you don’t want them to completely disintegrate. This will give you an idea of how I cut the onions. You’ll want 5-6 cups. 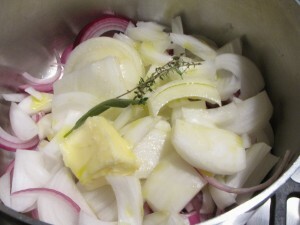 In a heavy pan add the onions, a tablespoon each of butter and olive oil, a sage leaf and a sprig or two of thyme. Add a pinch of salt. The onions, herbs, butter and olive oil and a pinch of salt. Now here’s where patience comes into play. Over very low heat cook the onions, uncovered, until they are a nice even golden brown, stirring occasionally. This is what you’re going for – nice, evenly cooked brown onions. Be careful not to scorch or burn. 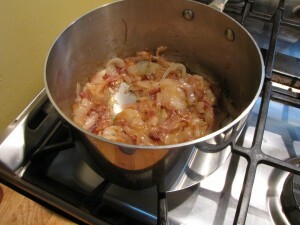 When the onions get to this point add two tablespoons of sherry. Stir and let cook with the onions for about 5 minutes. Remove the sage and thyme stem. Add three cups of good quality beef broth. Let the soup simmer for 20 minutes and then taste and add salt and pepper to taste. 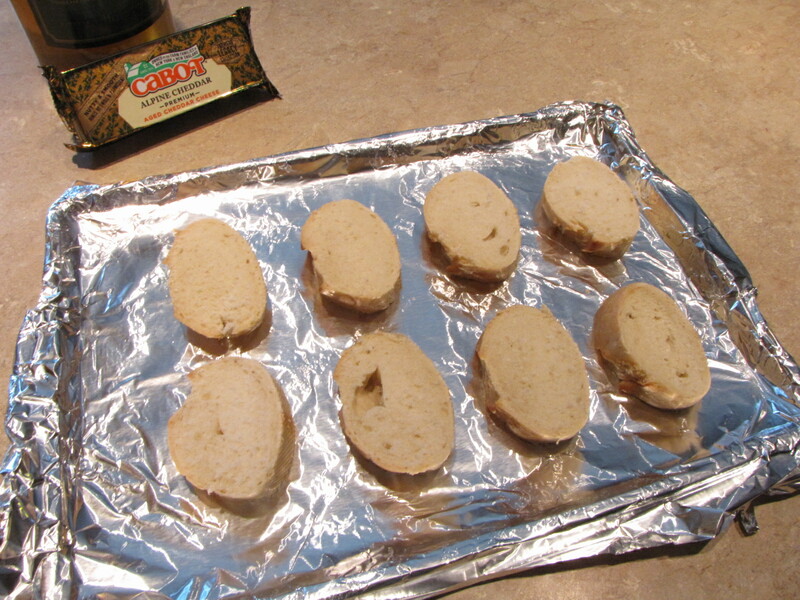 In the meantime, slice half a baguette into 1/2″ rounds. Slice the bread. Allow two per bowl. 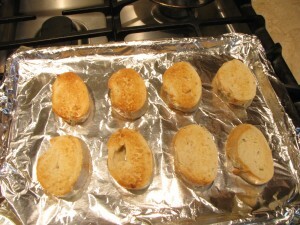 Place under the broiler and toast until brown. After one side is browned, flip the toasts and top with grated cheese. I used Cabot’s Alpine Cheddar because it tastes like what you’d get if cheddar cheese and Swiss cheese had a baby. It’s the perfect combination of the nuttiness of Swiss and the melty-ness of cheddar. Grate 3 oz. 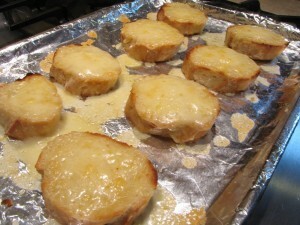 of cheese on the toasted bread and place under the broil until bubbly. I know. I know. You’re supposed to put your soup in those really cool looking crocks with the bread, top everything with cheese and then pop under the broiler. But what if you don’t have those cool bowls? That’s why I’m offering this alternative which turns out very nicely if I may say so myself. By adding the cheese toasts to the soup, you get a nice soup to cheese toast ratio – in my opinion. This recipe makes enough for two huge bowls of soup or enough for four cups of soup perfect for pairing with a sandwich or eating as a first course. Here’s the recipe so you can print it out and give it a try. Step by step instructions to making delicious French Onion Soup. Roughly chop or thickly slice the onions. In a heavy bottomed saucepan, over low heat, add the onions, butter, olive oil, sage and thyme. Cook over low heat, stirring every so often, until the onions are a nice golden brown. This should take about 45 minutes. Remove the thyme stem and sage leaf. Add the sherry and let cook for another five minutes. Add the beef broth. Taste and add salt and pepper to taste. Let simmer for another 20 minutes. In the meantime, slice the bread into ½" thick slices. Place under the broiler and toast until golden. Remove from oven and flip. Top with grated cheese. Place back under the broiler. Serve the soup with the cheese toasts on top. Disclaimer: Cabot provided me with the cheese that I used for this recipe. The recipe is my own. I love this recipe, just everything about it! And your description of Alpine (don’t tell anyone, but it’s my favorite of the Legacy Collection) is brilliant.